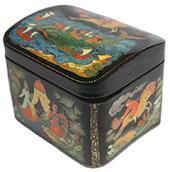 Konovalova Valentina is the artist who has painted this five-sided Palekh box that features several scenes from a tale of a Hump-backed Horse. Subdued tones of tempera paints predominate here. Gold and aluminum paint is applied within the composition to add brightness and detail. The application of metallic paint is very subtle yet yields great results. The edges of the lid are decorated with simple patterns composed of gold beads. The box's sides are adorned with an elegant leafy pattern completed with silver flowers. The box is constructed from paper-mache. Black lacquer is used to paint the exterior of the piece while red lacquer completes the interior of the work. The box has a hinge from the top of the scene, and rests on two platforms. The work is signed with the artist's name and the village of Palekh.